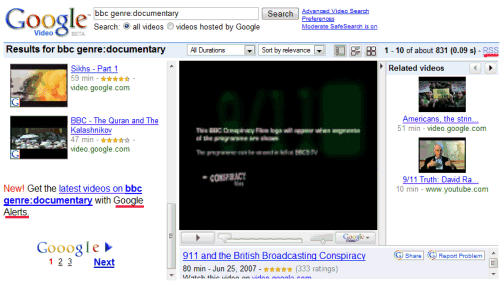 An unofficial blog that watches Google's attempts to move your operating system online since 2005. Not affiliated with Google. Send your tips to gostips@gmail.com. You can also use the genre: operator to better describe your search when you want to subscribe to a Google Video feed or to get an email alert when new videos are uploaded. At some point in Google Video's history, you could browse videos by genre directly from the homepage, but you can still use the genre: operator without any other keyword to see popular videos from a certain category, like TV shows. Nice search queries, however the new layout is useless, and only provides trivial films, the difference between quality of youtube and googlevideo is no longer there. Your new layout has no advantage over youtube. Before we could browse hundreds of videos while watch one. Very cool. Now there is no point in visiting you site again. Really, Thanks alot for these great tips. With genre:MOVIE_FEATURE, I can watch full movies. very very important operators that I need so much. So When Do We Get Folders in Gmail?